The sample I received was more than enough for about 15 shaves with. A word of caution when handling this soap because of the duck fat it leaves your fingers very slippery or at least it did for me you might just drop your razor so make sure you wash your hands before you start the shave. 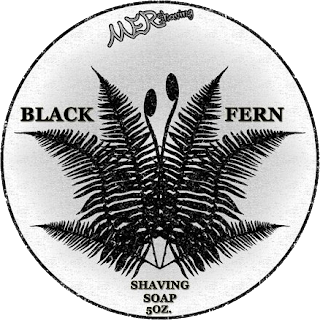 The scent of this is just fantastic I know why he calls it Black Fern because the scent is a combination of black pepper, black amber, oak, and bergamot this creates a dark fougere type fragrance. The only negative here would be the scents fade after the shave. If all the scent are in the same quality as this one it would be a great idea to make aftershaves to go along with them. The lather is also something to cheer about it makes plenty. I bowl lather with this and came up with more than what was need to do the job and I only used very little soap. When applying the lather I was able to get right into the beard providing great coverage. The slickness and glide are extremely good with this soap allowing me to go over trouble spots with my razor without the irritation of any kind. The post shave feel was also fantastic I just wish an aftershave was available to end it on a perfect note. So I say give this one a try and see for yourself I’m sure you’ll agree its a very unique shaving soap one that you’ll reach for many times.